Home / News / See the classic Oranje style! New Netherlands Home Shirt | See the classic Oranje style! Sadly, we are not going to see any Flying Dutchmen during this summers World Cup in Russia. But Nike has today given us something to comfort this sadness, and that’s the brand-new Netherlands Home Shirt, which they are going to use during the Euro 2020 qualification. The Netherlands are known as a powerhouse when it comes to producing talents. You might remember stars such as Cruyff, Van Basten, Gullit, Koeman, Overmars, Davids, De Boer brothers, Kluivert, Sneijder, Robben, Van Persie and many other class players! All these players have all been through the Dutch machine and become a world class player, while also wearing the famous Netherlands Home Shirt. When having star players, you also get some history. Even though the Netherlands haven’t won the World Cup, they still have achieved a lot of glory. The Netherlands Home Shirt was in the center of attention in the 1988 European Championship, where the Netherlands won the title. Furthermore, the Netherlands have also ended as Runners-Up three times during the World Cup history, which is a record many Dutch people will think of with mixed emotions. So, even though they aren’t qualified for the World Cup, their history combined with their young talents make their future look bright! The new Netherlands Home Shirt is mainly made in the classic orange colour, which has been associated with the Dutch team since the beginning of time. The shirt has black details on the back of the neck and on the crest of the Royal Dutch Football Association (KNVB). The shoulders have been applied with a cool striped graphic made from a slightly lighter shade of orange. The Home Shirt is also made with the Aeroswift 2.0 technology, adding more ventilation and durability to the shirt. A lion has also been applied to the black stripe on the back of the neck, making a referral to the crest. But what’s a Home Shirt without an Away Shirt? 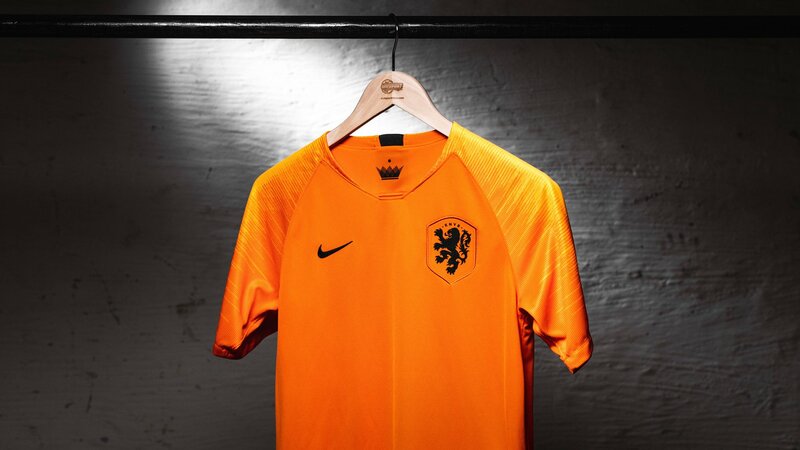 The Netherlands Away Shirt was also released today, but will first be available on unisportstore during May. The Away Shirt is made with two tones of blue. A lighter blue, which is used for the base of the shirt, and a darker blue for the KNVB logo, while a striped pattern is placed on the front. This striped pattern takes us back to the 1988 Home Shirt, a shirt the Netherlands won the European Championship with. With two shirts that represent the Golden Days of Dutch football, but with an added modern twist, the Dutch national team is ready to look at the future with high hopes of qualifying for the Euro 2020. Can't you wait for the European Championship qualification games? Then find your own new Netherlands Home Shirt on unisportstore.com from the 26th April.